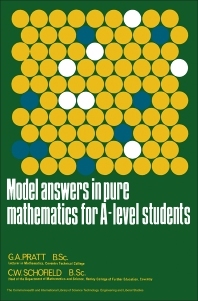 Model Answers in Pure Mathematics for A-Level Students provides a set of solutions that indicate what is required and expected in an Advanced Level examination in Pure Mathematics. This book serves as a guide to the length of answer required, layout of the solution, and methods of selecting the best approach to any particular type of math problem. This compilation intends to supplement, not replace, the normal textbook and provides a varied selection of questions for practice in addition to the worked solutions. The subjects covered in this text include algebra, trigonometry, coordinate geometry, and calculus. This publication is valuable to students; working through and coping with the practice questions will help them face advanced mathematical examinations with confidence.